As professional CD/DVD to ISO maker software, Xilisoft ISO Maker helps you fast convert CD/DVD to ISO files to ease your CD/DVD backup on computer, portable hard disk, etc. No matter data CD/DVD or video Home DVD you have, the smart ISO maker can easily convert it to make ISO image file with fast speed. 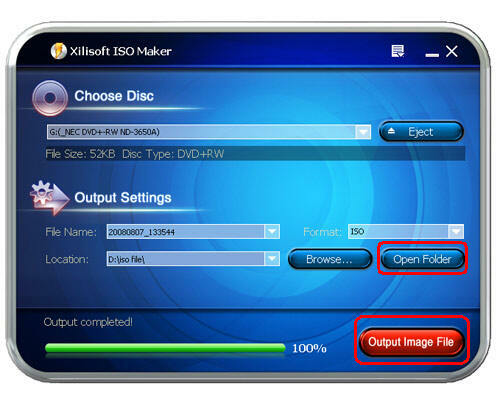 Xilisoft ISO Maker is your dream ISO creator tool to convert CD/DVD as ISO image file, and backup CD/DVD on hard disk. Shining features like automatic updates and multiple language choices are included in the smart ISO maker. No complicated operations, no time waste, just make ISO file from CD/DVD with Xilisoft ISO Maker now. Fast speed, high quality Make CD/DVD into ISO image, to copy and backup CD/DVD onto computer or other storage medium with high speed. High compatibility Either data CD/DVD or video DVD can be ripped and made into ISO image files with Xilisoft ISO Maker. Professional ISO maker As professional ISO maker, this ISO creator turns CD/DVD to ISO files conversion fairly easy without more operations. Set after done actionNo need to wait till the conversion finished, preset the after done action to exit the ISO creator, shutdown, stand by, or hibernate automatically. Check log fileA log file is created to record the CD/DVD to ISO conversion details for your check and reference. Auto check for updatesThe program checks for updates automatically after launched, then you will not miss the latest features. Optional interface languagesXilisoft ISO Maker offers English, German, Japanese, Simplified Chinese, and Traditional Chinese for you to choose.